Gajar Ka Halwa or Carrot Halwa is a traditional Indian sweet or dessert made with fresh red carrots, milk and sugar. It’s a winter delicacy and is made using the juicy red carrots. My mom makes the best ever carrot halwa and today I am sharing her simple and easy recipe to make this. Here is how to make carrot halwa (Gajar Ka halwa) recipe (Step by Step). Carrots are considered a vegetable, and used in all kinds of vegetable gravies, curries and desserts. Gajar Ka Halwa is one dish where the sweetness of the carrots is allowed to shine. This sweet pudding mainly associated with North India is a rich, creamy dessert made using sugar and full cream milk or condensed milk and khoya. I haven’t heard of any Indian who doesn’t love a good carrot halwa. Have you? Garnished with slivers of dry fruits, it goes well with a dollop of ice cream on the side. This dessert is very popular across India and many functions and weddings often end with this halwa served after meals. 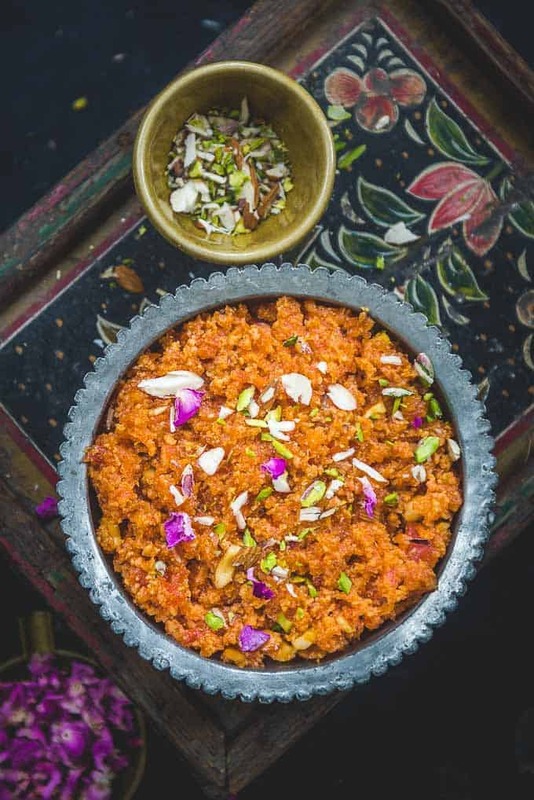 Most households in North Indian have their own recipe to make Gajar ka Halwa and with minor changes here and there, the taste changes drastically. This recipe to make this simple Carrot Halwa is my mom’s and is one of the best I have had. And it’s not the daughter in me speaking. Whoever have tasted her Gajar Ka Halwa till date swear by it. My parents are visiting me these days and I asked my mom to make a small batch of Carrot Halwa so I could note down the quantity of the ingredients and see the method clearly. Since we had already gorged on the 5 kg halwa that she brought along when she came here, we decided to go for only half kg Gajar this time. You can easily double or triple the quantity of the ingredients and make a bigger batch if you want to. Along with the ingredients, the cooking time will also increase, so keep that in mind. Here is how to make Carrot Halwa. 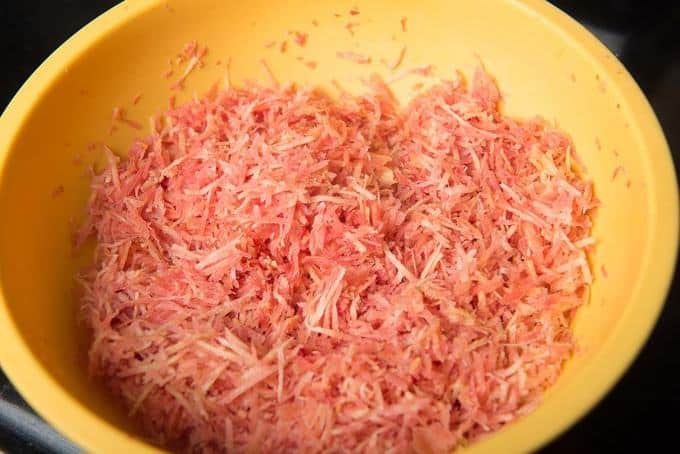 Use red carrots to make this halwa. These carrots are available only in winters and the real taste of this halwa shines through when you use red carrots to make it. 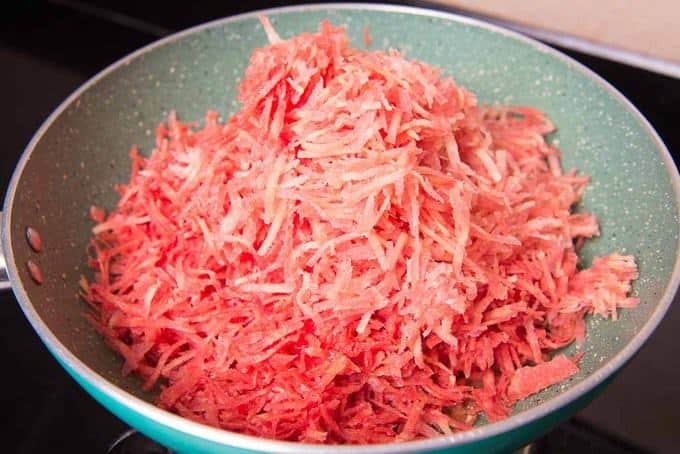 Do not fry the grated carrot before adding milk otherwise they will turn dark in colour. 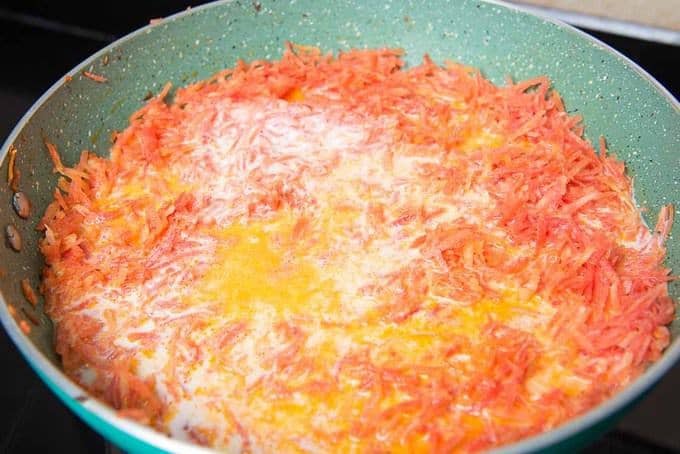 Add milk and carrots together in the pan and cook. Grate the carrots to medium thickness. If you grate them too thin, the halwa will become mushy and if too thick, the pieces will stand out. Keep stirring the halwa at regular intervals. It need a lot a muscle work. Make this halwa in batches if you are not able to handle all the heavy work. 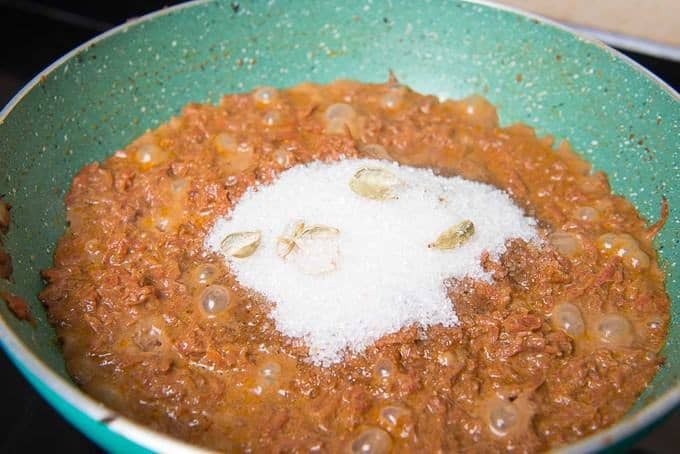 You can freeze the halwa for 1-2 months. Just transfer it in a freezer safe box and freeze. Thaw before using and warm in microwave. 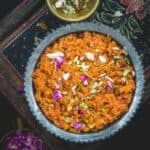 You can make this gajar halwa without khoya also. Increase the amount of milk by 1/2 litre and skip the khoya. Follow the remaining process exactly. However, the real of taste comes when khoya is added to it. So skip it, if it is really not possible. Gajar ka halwa can be made in a slow cooker too. Check out this recipe here. You can also add 1/2 beetroot to the halwa and make carrot beetroot halwa. 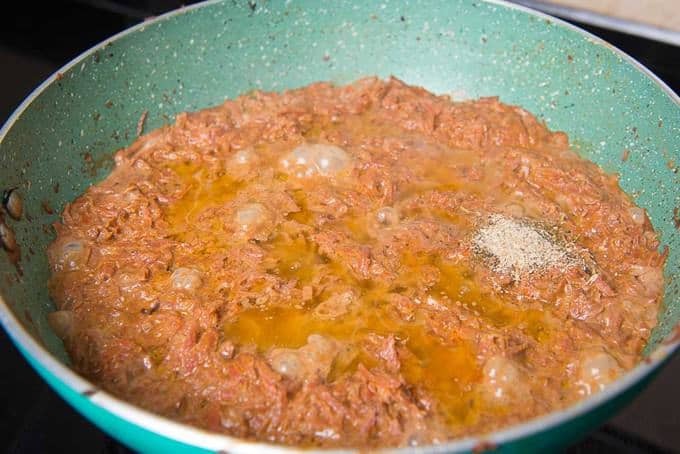 How to make Gajar Halwa recipe in microwave? To make carrot halwa in microwave, add carrot and milk in a bowl and microwave on high for 6 minutes. Add ghee and and cardamom powder and microwave for another 5 minutes. Now add sugar and microwave for 4 minutes. Add khoya and microwave for 5-6 minutes. See if the ghee has separated on the sides. Otherwise microwave for another 2-3 minutes. Garnish with dry fruits and serve hot. 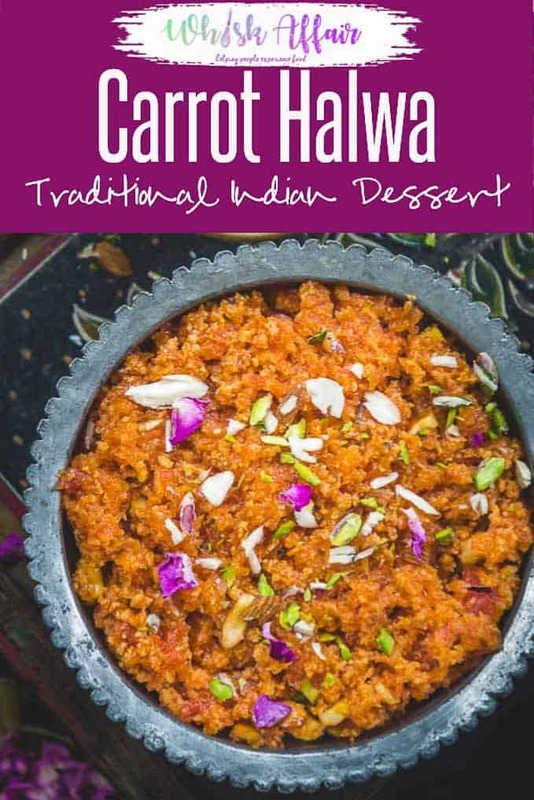 How to make Carrot Halwa in pressure cooker? To make gajar ka Halwa in pressure cooker, add milk and carrots in a pressure cooker. Pressure cook for one whistle on high heat and one on low heat. Let the pressure release. Add ghee and cardamom powder and cook for 3-4 minutes. Add sugar and cook for 3-4 minutes. Now add khoya and cook until ghee starts to separate from sides. Garnish with dry fruits and serve. 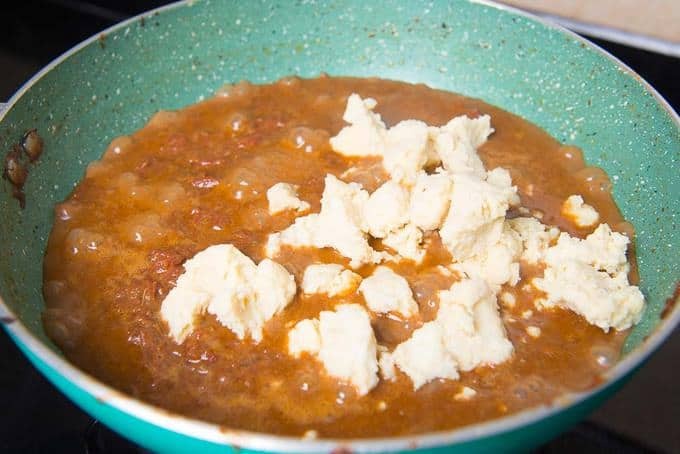 How to make Carrot Halwa with condensed milk (Milkmaid)? To make carrot halwa using condensed milk, just replace it with half of the khoya and use 1/2 cup condensed milk instead. You can reduce the sugar amount also as condensed milk is slightly sweet. You can add 1 cup milk and skip adding the khoya at all. This comes in handy when Khoya is not available. Make sure to adjust the sugar since condensed milk has a lot of sugar in it already. Why do Gajar ka Halwa turn black sometimes? 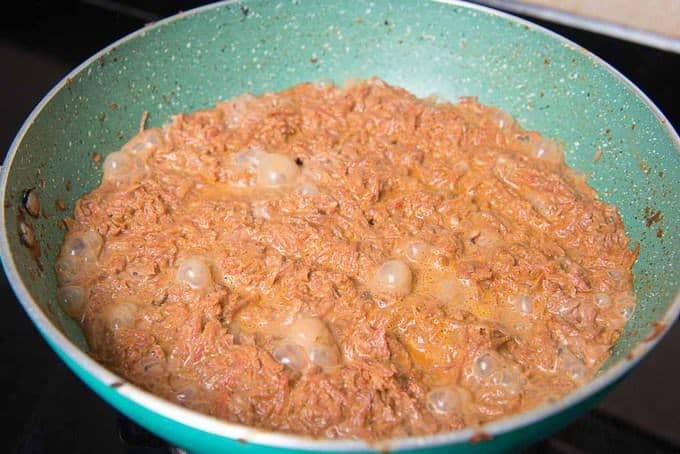 Do not fry the gajar in ghee. It tuns their colour and makes the halwa black. Always add carrots and milk together in the pan and cook until milk absorbs. Add the ghee later. Wash the carrot and peel them. Grate the carrot to medium thickness. Add the carrots and milk in a pan. Cook on low heat until all the milk is absorbed. Add ghee and cardamom powder in the pan. Fry for 4-5 minutes on low heat. Keep stirring continuously. Add sugar and cook for another 4-5 minutes. Gajar Ka Halwa or carrot halwa is a traditional Indian sweet or dessert made with fresh red carrots, milk and sugar. It's a winter delicacy. Wash the carrot and peel them. Grate the carrot to medium thickness. Add the carrots and milk in a heavy bottom pan and cook on low heat until all the milk is absorbed. Add ghee in the pan along with cardamom powder. Fry for 4-5 minutes on low heat. Add grated khoya and cook for 15-20 minutes on low heat until ghee starts to leave on the sides. A perfect dessert for winter season. Though I was thinking that maybe I’ll try adding ghee first, then follow the entire steps. What’s your take on it? Do try. That’s how we all learn. For this particular dessert, I blindly follow my mom’s recipe and never deviate from it. carrot halwa A Perfect dessert for the winter session. Thank you so much for sharing your recipes step by step with such good images. I’ll Definitely try this at home.